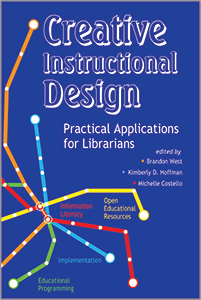 CHICAGO – The Association of College and Research Libraries (ACRL) announces the publication of “Creative Instructional Design: Practical Applications for Librarians,” edited by Brandon K. West, Kimberly D. Hoffman, and Michelle Costello. This is a comprehensive exploration of why instructional design is so impactful for academic librarians—intentionality, collaboration, and engagement—and provides extensive examples of how librarians are using instructional design to craft and assess new and innovative services, teach information literacy, develop online content, and design programs and outreach initiatives in a targeted and mindful way. With the explosion of accessible information online and students feeling more and more independent in their searching skills and information needs, libraries are shifting to user-centered models. These changes are requiring librarians to define the library by the services it can provide, especially innovative ones, such as publishing services, scholarly communications, and project management. Regardless of the instructional format, from classes to workshops to videos to worksheets, instructional design strives to ensure that potential learning gains by students are maximized and that the instruction is evaluated for improvement in future iterations. "Creative Instructional Design" examines ways in which librarians are using instructional design principles to inform, construct, or evaluate information literacy initiatives; online library instruction and services; and programming and outreach efforts, and provides ways for instructors, trainers, and educators to both approach instruction creation systematically, and evaluate how it has been effective and how it can be improved. “Creative Instructional Design” is available for purchase in print and as an ebook through the ALA Online Store and by telephone order at (866) 746-7252 in the U.S. or (770) 442-8633 for international customers.